Thanks to everyone who has made a donation, attended one of our events or participated in our other fundraising efforts. Please see below photos of a letter and receipt (plus english translation) we just recieved from the Zapatista communities we are working with. Keep your eyes and ears open for events we have coming up this year! By way of this letter we send a cordial revolutionary greeting to your group in New Zealand, on the part of the authorities of the council of good government. We thank you for your support that has helped us here in the good government and we hope that you continue to assist us as you know well that we are not earning much money as we are in the resistance, as we work to build Autonomy. This is all that we request, and we hope this finds you well and working. The council of good government of El Camino Del Futuro met with Julie webb Pullman of the New Zealand Zapatista Support Group . A donation has been delivered to the council of good government of $1,000 dollars ($14,000 Mexican Pesos) and some books for the autonomous education programmes. The council of good government received this donation and also the educational books and we thank you for your support. Your group has helped us since 2006 and we hope to continue together into the future. Once again we send you our words. This is what we see, what we are looking at. This is what has come to our ears, to our brown heart. Above they intend to repeat history. They want to impose on us once again their calendar of death, their geography of destruction. The countryside both kills us and dies on us. We are the illegal, the undocumented, the undesired of the world. And there above they preach to us resignation, defeat, surrender, and abandonment. Here below we are being left with nothing. There is no ear for our pain, that is not like what we are. We are alone, alone with our dignity and our rage. We must listen to each other then, learn to know each other. So that our courage and rage grows and becomes hope. So that our dignity takes root again and births another world. Our voice is small to be the echo of that word, our gaze small for so much dignified rage. The process of seeing each other, looking at each other, speaking to each other, listening to each other, is still lacking. If this world does not have a place for us, then another world must be made. With no tool other than our rage, no material other than our dignity. We still must encounter each other more, know each other better. Now, three years after the Sixth Declaration of the Lacondon Jungle, the EZLN has undertaken a collective reflection, nourished by the broad horizon that our compañeros of the Other Campaign in Mexico and in the Zezta Internazional across the world have given to us. It is not little that we have seen and heard, sometimes directly, sometimes through the words and the gaze of others. The rage that we felt and the dignity that we found was so great that we think now that we are smaller then we thought before. In Mexico and on the five continents we have found what we intuited when we began our sixth step: there is another world, there is another path. If the catastrophe that is coming can be avoided and humanity is to have another opportunity, it will because these others, below and to the left, not only resist, but are already drawing the profile of something else. Something different than what is occurring above. In the impossible geometry of political power, the fundamentalists are distributed evenly: the right becomes ultra-right and the institutional left becomes the impossible cultured right. Those who make up the progressive media complain that the fanatics of the mainstream press censure them, twist their words and slander their cause, but they at the same time censure, twist the words, slander, and silence any movement that hasn’t bowed down to the dictates of their ringleaders. And without shame they condemn and acquit to the rhythm of a senseless media rating. Fanatics on all sides fight over lies dressed as truths and crimes are measured by the media time that they occupy. But this is nothing other than a pale reflection of what is happening in politics. Weariness of the cynicism and incompetence of the traditional political classes has been converted into rage. Sometimes this rage is oriented toward hoping for change in the same paths and places as always, and it is there immobilized by disillusionment or trampled by an arbitrary force. The unsettled and brutal north goes back to its old ways. When it is not sponsoring electoral fraud (like in Mexico), it is promoting, encouraging, and financing state coups (as attempted now in Bolivia and Venezuela). War continues to be its primary and favored form of international diplomacy. Iraq and Afghanistan burn, but, to the despair of those above, are not consumed. The impositions of hegemony and homogeneity on a global scale find in nations, in regions, and in small locales, their witches’ apprentices that try for that impossible historic return to a past where fanaticism was law and dogma, science. Meanwhile, the governing political classes have found in the world of bright lights an adequate disguise to hide their full participation in organized crime. Sickened by so much greed, the planet begins to pay the unpayable bill of its destruction. But “natural” disasters are also class issues and their devastation is felt most by those who have nothing and are no one. Faced with this, the stupidity of Power has no limits: millions and millions of dollars are dedicated to manufacturing new weapons and installing more military bases. The Power of capital does not worry about training teachers, doctors, engineers, but rather soldiers. It doesn’t prepare constructors, but rather destructors. And those who opposed this are the pursued, incarcerated, murdered. In Mexico, farmers who have defended their land are in prison (San Salvador Atenco); in Italy those who opposed the installation of military bases are pursued and treated as terrorists; in the France of “liberty, equality, and fraternity,” humans are only free, equal, and brothers if their papers say so; in Greece being young is a vice that must be eradicated; again in Mexico, but now in that city of the same name, young people are criminalized and murdered and nothing is done because it is not on the agenda that those above dictate. Meanwhile, a legitimate referendum is converted into a shameful way for and assassin-governor to wash his hands of a situation. In the Spain of the modern European Union, publications are closed and a language, Euskera, is criminalized-they think that by killing the word they can kill those who speak it; in that Asia that is so close, the peasant demands are answered with armored injustices; in that arrogant American Union, born in the blood of migrants, the “other colors” that work there are pursued and killed; in the long wound that is Latin America, the brown blood that sustains it is despised and humiliated; in the rebellious Caribbean, a people, the Cuban people, are forced to live under an imperial embargo that is nothing other than a punishment without crime. And in all of the corners of the world’s geography, and in all of the days of its calendars, those that work, those that make things run, are plundered, despised, exploited, and repressed. But sometimes, many times, as many times as a smile sets it off again, rage looks for its own paths, new paths, other paths. And the “no” that these multiple rages raise now not only resists, but begins to propose, to become. Since our appearance in public, now almost 15 years ago, it has been our goal to be a bridge on which the many rebellions in the world can walk back and forth. Now we see and we feel not only the rebellious resistance that, as sister and comrade, stays at our side and encourages our steps. Now there is something that before wasn’t there, or that we weren’t able to see before. A rage that paints all of the colors of the paths of below and to the left on the five continents…. THE OTHER MEXICO CITY, FEDERAL DISTRICT, December 26, 27, 28, and 29, 2008. IN LIENZO CHARRO OF THE ASSOCIATION LOS CHARROS REYES DE IZTAPALAPA, Frente Popular Francisco Villa Independiente-UNOPII, Avenue Guelatao # 50, Colonia Álvaro Obregón, Delegación Iztapalapa, close to the metro station Guelatao, where an exposition will be presented. AND IN THE HEADQUARTERS OF UNÍOS, Dr. Carmona y Valle street #32, colonia Doctores, close to the metro station Cuauhtemoc, where other activities will be held. THE CITY OF SAN CRISTÓBAL DE LAS CASAS, CHIAPAS, on the 2nd, 3rd, and 4th of January, 2009, IN CIDECI located on the Camino Real de San Juan Chamula s/n, Colonia Nueva Maravilla. 1. In Mexico City, a national and international exposition will be installed where every struggle, every experience, every rage, will have a space where it can set up and show its struggle and its courage. This way we can all see, hear, and know each other. 2. In zapatista territory, dignity and rage will become art and culture, music and song, because rebellion also dances. And with words, pain will become hope. 4. The national and international groups, collectives, and organizations that participate in the festival will be only those who are invited to do so. 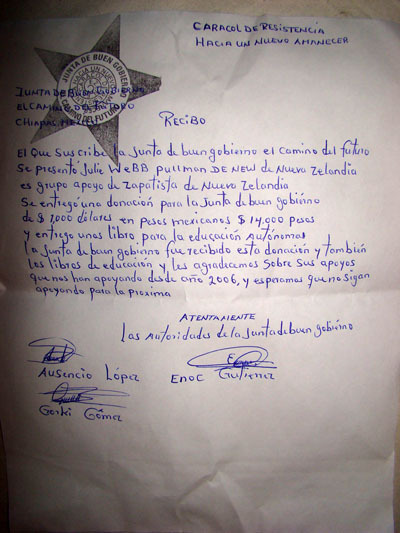 To this end, the Sixth Commission of the EZLN has initiated consultations with political and social organizations, as well as with groups and collectives of anarchists, libertarians, alternative communication workers, human rights defenders, sexworkers, intellectuals, social activists, ex political prisoners, all adherents of the Sixth Declaration; and with groups, collectives, and organizations of other countries, all part of the Zezta Internazional. The criteria for invitations and participations will be made after these consultations. 5. For the roundtables, the EZLN will invite social organizers, thinkers, and leaders of anticapitalist projects from Mexico and around the world. The list of invitees will be released later. 6. More details about what we are thinking the festival of dignified rage could be will be made known at earliest convenience (that is, when we have an approximate idea of the problem we have gotten ourselves into). For the Indigenous Revolutionary Clandestine Committee-General Command, of the Zapatista Army for National Liberation. 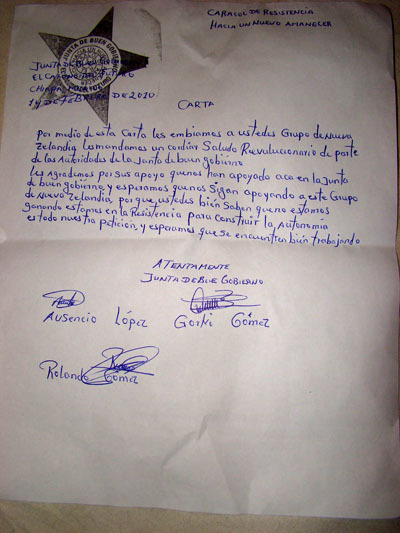 The Road to the Future Good Government Council denounces the military incursion of 200 soldiers, along with local, state and judicial police into the Zapatista towns Hermenegildo Galeana and San Alejandro, in La Garrucha Caracol. 1. A column was sighted consisting of a military convoy and public safety police, municipal police, and judicial agents at 9:00 in the morning southeastern time; there were 2 big trucks and 3 small trucks of soldiers, 2 public safety trucks, 2 municipal police trucks, an anti-riot tank, and a truckload of judicial agents. 2. All in all there were around 200 provocateurs. 3. Before entering the town of Garrucha, the headquarters of the Caracol, about 30 meters from the edge of the town, 3 trucks from the convoy stopped and 4 soldiers got out of a truck as if to outflank the town of Garrucha by using the road to our collective cornfield. The people reacted and organized themselves to eject the convoy. The soldiers immediately got back in their truck and continued along the road. Those in front were intimidating the people, taking photos and filming them as they waited for the other provocateurs. 4. Arriving at the spot where the soldiers from Patiwitz were stationed,another military convoy joined the column, which continued on its way to engage in another provocation. 5. They arrived at Rancho Alegre, a community known as Chapuyil. 6. They got out of the trucks and headed for the town of Hermenegildo Galeana, where all the people are Zapatista support bases, accusing the townspeople of growing marijuana in their fields. 7. People throughout the Zapatista area of Garrucha, including the autonomous authorities, are witness to the fact that no such fields exist. The Zapatistas here work in their cornfields and banana plantations. They are willing to struggle for freedom, justice, and democracy and resist any provocation whatsoever. 8. Around 100 soldiers, 10 public security police, and 4 judicial agents headed for the town of Galeana. All the repressors painted their faces to confuse people and to avoid being recognized in the hill country. They walked for a while on the road and then went into the hills on their way to the town. 9. The federal column was guided by a person named Feliciano Román Ruiz, who is known to be from the Ocosingo municipal police. 10. The townspeople of Galeana (men, women, girls, and boys) organized themselves to eject the troops, come what may. 12. The soldiers said, “We came here because we know there’s marijuana here and we’re going on ahead come hell or high water.” That’s when the people took out their machetes, shovels, rocks, slingshots, ropes and whatever was at hand, and drove them back. 14. They took another road down to the village of Zapatista support bases called San Alejandro where 9 vehicles with 40 soldiers and 10 policemen were waiting for them. 15. On their way down, they trampled the cornfield, which is the town’s only food source. 16. In the Zapatista town of San Alejandro, the 60 repressive agents took up their positions, ready for a confrontation. 17. The people reacted and used everything at hand to drive back the federal forces. 18. Soldiers from Toniná, Patiwitz, and San Quintín participated in the confrontation. 19. People of Mexico and the world, we want to tell you that it won’t be long before another confrontation occurs, provoked by Calderón and Juan Sabines and Carlos Leonel Solórzano, the municipal president of Ocosingo, who’ll call out their dogs from all the forces of repression. We are not drug dealers. As you know, we are brothers and sisters of Mexico and the world. It’s clear that they’re coming for us Zapatistas. All three levels of the bad government are coming after us, and we’re ready to resist them if that’s what’s necessary, just as our slogan says: We’ll live for our homeland or die for freedom. 20. People of Mexico and the world, you know that our struggle is a peaceful, political one. As it says in the Sixth Declaration of the Lacandon Jungle, it’s a peaceful, political struggle known as the Other Campaign. Just look where the violent provocation is coming from. 21. Comrades of the Other Campaign in Mexico and other countries, we ask you to be on the alert because the soldiers said they’ll be back in two weeks. We don’t want war. We want peace with justice and dignity. But we have no other choice than to defend ourselves, resist them, and eject them when they come looking for a confrontation with us in the towns of the Zapatista support bases. 22. All we can tell you is to look and see where the provocation is coming from. We’re now informing you of what’s going on, hopefully in time. That’s all we have to say.